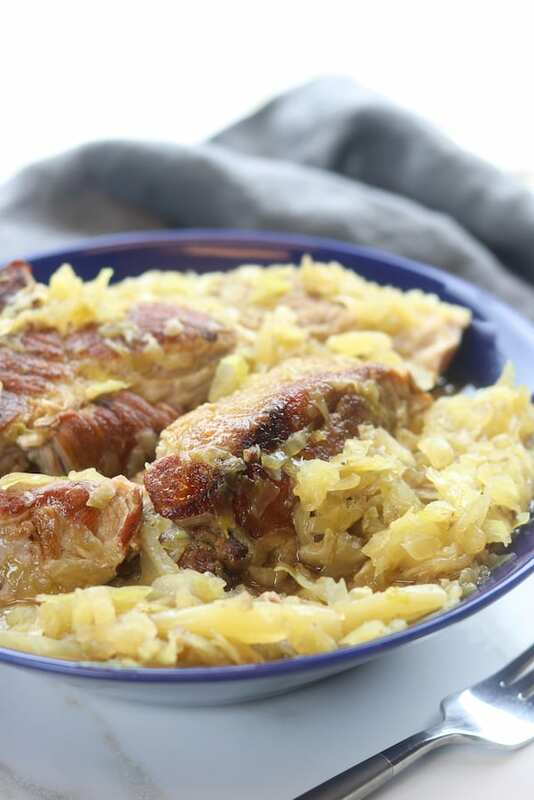 An absolute comfort meal, Country Style Pork Spare Ribs and Sauerkraut recipe creates extremely tender caramelized pork nestled into tangy sauerkraut. 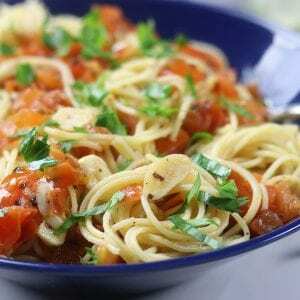 With just 3 ingredients and 2 steps this family favorite recipe is an extremely easy slow cooked meal. 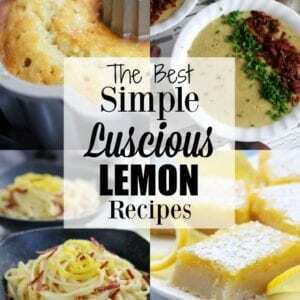 Do you have recipes that have stayed in your family for generations? This Country Style Pork Spare Ribs and Sauerkraut recipe has been in my family for more generations than I can keep track of. I remember eating this in the 70’s as a child but I especially remember eating this every single week in the 80’s with out fail during my mom’s pregnancy with my baby brother. This was my mom’s pregnancy craving BIG time! I realize that sauerkraut is an acquired taste so I was a little concerned that my husband may cringe at the idea of eating this meal. 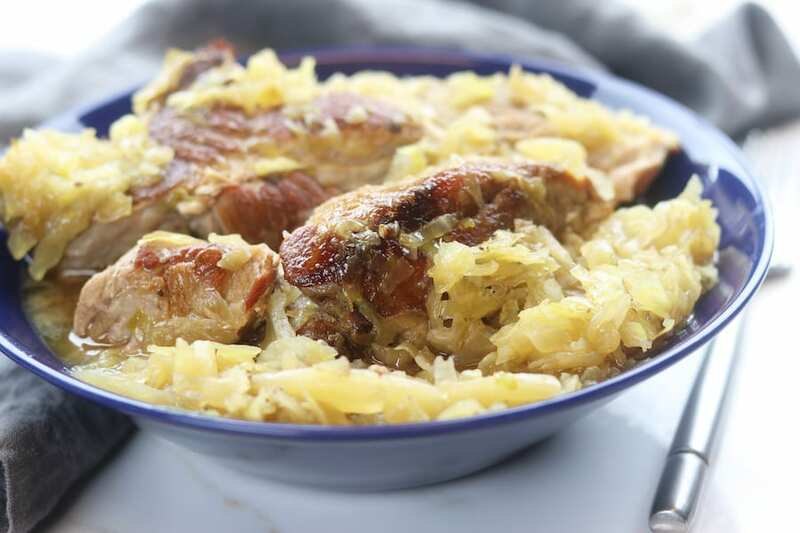 There are a couple of elements that I personally absolutely adore about this Country Style Pork Spare Ribs and Sauerkraut recipe. The meaty ribs are so tender they just literally fall apart. I also adore that the meat juices impart a ton of flavor into the sauerkraut thereby also mellowing the tanginess. I have a favor to ask though. PLEASE, PLEASE, PLEASE don’t send me hate mail. This Country Style Pork Spare Ribs and Sauerkraut recipe steers a little away from your traditional German or Polish version of spareribs and sauerkraut in that it does not have potatoes, brown sugar or apples. Rest assured though that this version is incredibly irresistible and an absolute family favorite. Sauerkraut in its simplest form is fermented cabbage that produces gut healthy probiotics. Many scientists now believe that much of our immune system resides in our digestive tract and is run by healthy bacteria. Sauerkraut, with all its healthy bacteria, feeds our intestinal lining those very healthy bacteria. Many health experts hold the belief that the best form of sauerkraut is organic unpasteurized versions found in many health food stores. Unfortunately the heating process of this Country Style Pork Spare Ribs and Sauerkraut recipe does kill many of those healthful bacteria. To reap the benefits of improved immune function by eating sauerkraut then the best way to achieve this is to eat 2 tbsp of raw organic unpasteurized sauerkraut daily. Here are a few more ideas that may help too. Pull meat from refrigerator and let sit at room temperature for about 10 minutes before searing. I personally prefer cast iron or stainless steel pans for searing. Place pan over medium/high -high heat. Add oil and let pan become very hot. You can check to see if the pan is hot enough be either by seeing the oil ripple or by placing the tip of a rib onto the pan and if it sizzles, it is ready. Place ribs onto pan with the fattiest side down first and do not move. The ribs will be ready to turn when they are easily moved (no longer sticking to the pan) and golden brown. Repeat with all sides. The awesome raw organic unpasteurized version of sauerkraut that I describe above can be a bit spendy but luckily Costco has a great price on it for $7.99 for a container that runs a little under 1/2 gallon. I recommend buying the best quality of pork you can afford. In my opinion the best would be pork raised organically on pasture, but at least try to aim for pork raised without antibiotics. Here is a great resource for finding a pasture-based farm near you! Country style ribs are a very meaty cut of pork that contain no bones and are perfect for this Country Style Pork Spare Ribs and Sauerkraut recipe. BIGGEST TIP I can give about this Country Style Pork Spare Ribs and Sauerkraut recipe is DO NOT salt the pork before searing. Normally you would salt meat before searing but because sauerkraut is already salty, salting the meat will just be too much. 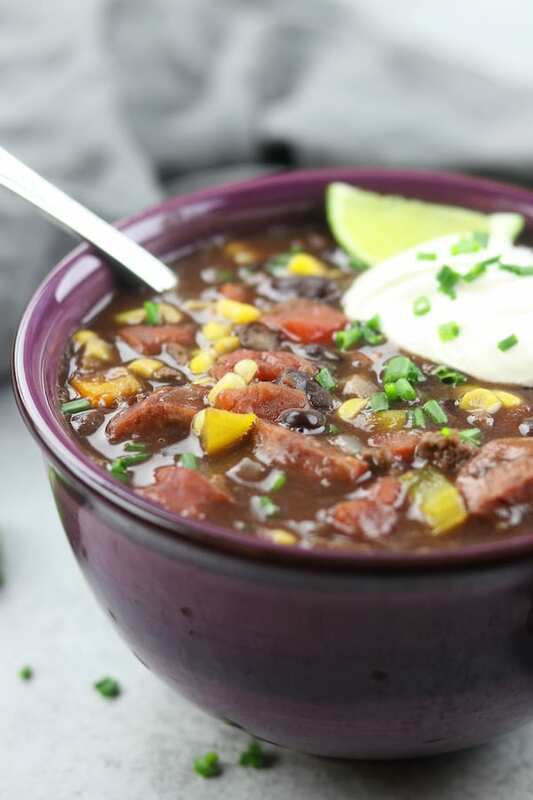 This recipe can also be made in a slow cooker for 8-9 hours on low. Country Style Pork Spare Ribs and Sauerkraut recipe creates extremely tender caramelized pork nestled into tangy sauerkraut. Place large frying pan or indoor grill over med/high- high heat. Add oil and bring pan up to a full heat. (see tips above for testing heat of pan). Sprinkle ribs with black pepper and place fattiest aside down onto pan. Sear all sides until golden brown. Place seared meat into dutch oven and top with sauerkraut. Cover dutch oven with lid and bake for 3-3 1/2 hours. I was wondering if you could use a pork loin roast or bone in pork chops in place of the country style spare ribs? I think it is a great idea. You won’t have as many golden brown surfaces as you would with the country style ribs but I know it will still taste wonderful. I hope you enjoy!! I’m so excited to see this recipe! With the exception of my family, I did not know anyone else made this. My mother did and now my siblings and I continue. 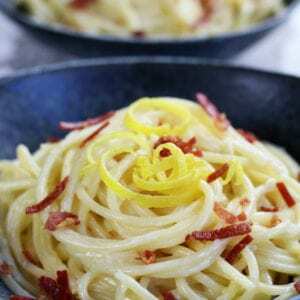 this fabulous and simple recipe. I cannot understand why anyone would send hate mail over this recipe!, especially without trying. Thank you for sharing. That makes me so happy to hear Dru!!! My family loves this too and my mom literally prepared this every week growing up when she was pregnant with my brother. I received a few complaints on my Facebook page for it not being completely traditional. That is ok though, both our families know how delicious it is. ???? How about in a slow cooker? Can we go with a 4 or 6 hr cook? 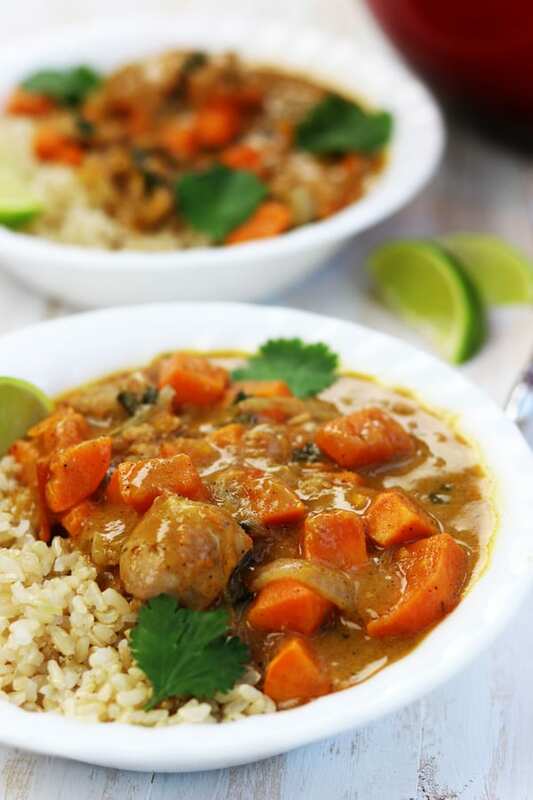 It takes approximately 8-9 hours on low in a slow cooker and about 4 1/2-5 hours on high. If I do the slow cooker method do I still sear the pork? I would recommended as it adds a wonderful flavor. I grew up with food like this, I love it! 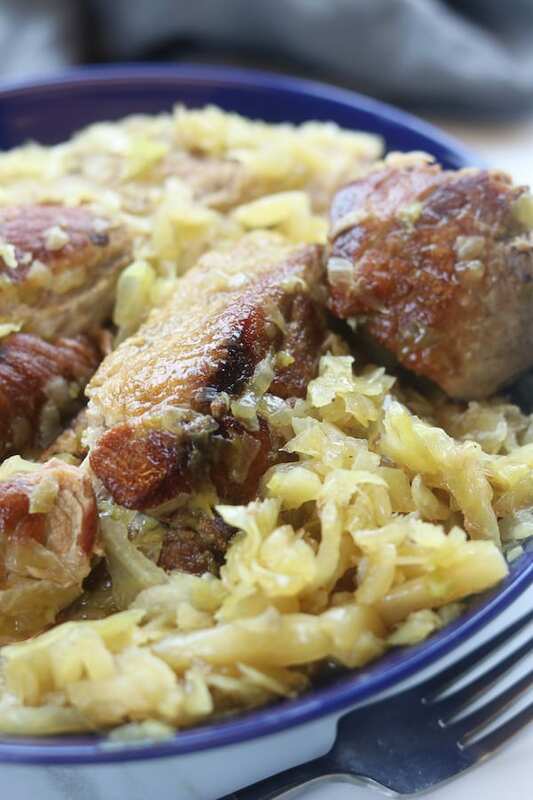 I love sauerkraut, but when cooked along with pork, it takes on a whole knew kind of love! What a comforting, super delicious combo! Thank you Liz! I feel the same way. There is something about this combination that his so good. Yay!! I am so glad you shared. My family loves this one! I am so glad to hear! Thank you so much for sharing. 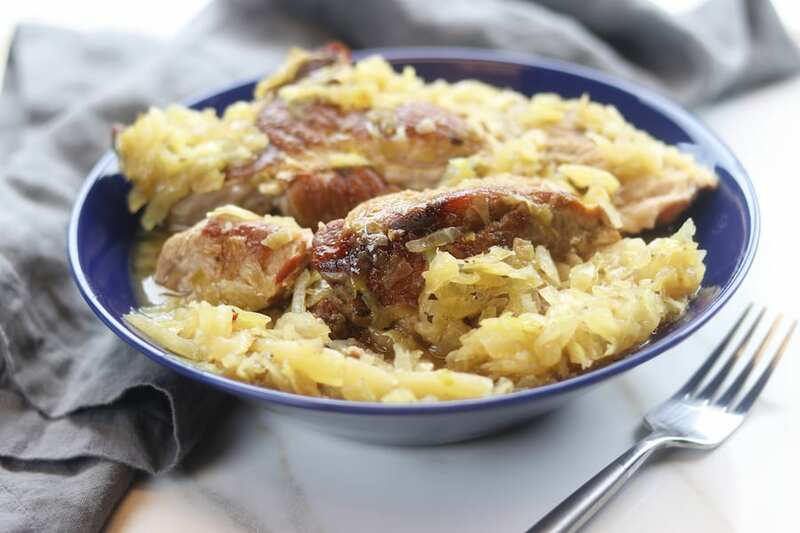 Pork and sauerkraut are a great combo, this is a definite hit with my family. Yay!! I am so happy to hear that! ???? Thank you Toni! If you love sauerkraut it really is. This reminds me of eating at my Great Grandmother’s house as a child. She made her sourkraut from scratch. So tasty! That is so awesome! I would love to make mine from scratch too. Bucket list! ???? 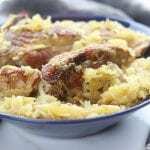 Such a brilliant dish, and I love combining ribs and sauerkraut! Thank you Joanne! It brings back sweet memories of my mom and how much she loved it. When I was a child my mother would cook each kids favorite meal. This was always my pick. That just made me smile! It brings back so many memories for me also. Do you drain the sauerkraut first? Hi Cheryl! Yes, I spooned the sauerkraut out of the container using a slotted spoon. It’s not a big deal though if extra juice gets in the pot. It really comes down to a personal preference. No hate here – nothing but love and good blessings for the new year! 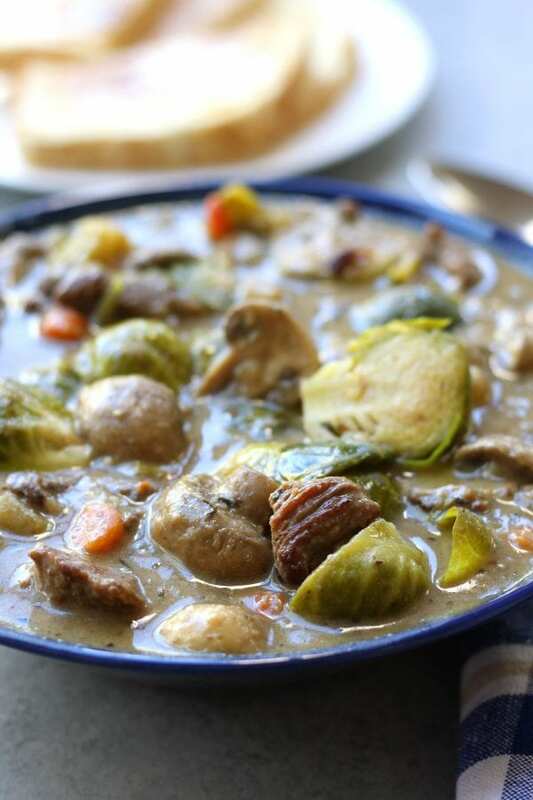 Thank you for posting this recipe – this is definitely a comfort food I grew up with – my mom used to make it a lot when I was growing up and I couldn’t remember which pork cut she used to make it. She actually did it on the stove in a large pot over low-heat, but I think it would be perfect in a slow-cooker. My mom is getting older and doesn’t do as much scratch cooking as she used to. She’s discovered bag meals and it’s pretty much her go-to these days. Looking forward to trying out your recipe! I think I will make it the next time I visit my parents and cook it for them. Thanks again! Thank you Ann! I love this so much. We have done made in a slow cooker and on the stovetop also and it always is great. I am working on updating with all the approaches soon. Hi Brenda! I don’t at the moment but half tight. It is one of my goals for the year. Glad that i found this recipe and happy that is not the traditional way. 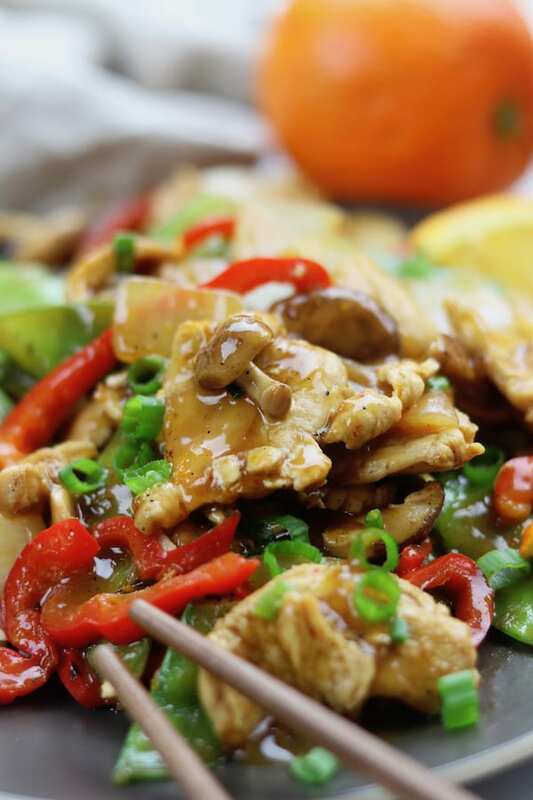 Without the brown sugar and apples, it is low carb friendly ! Yay! That makes me so happy. I love the simplicity too. This looks great. I think it would be low to moderate WW points, too. Thank you Holly. I think if you find country style spare ribs that are a little lower in fat it would work great. I hope you enjoy! Hi. I make a version of this from time to time for my buddies ….. i will add carrot s – pots – onion from time to time with dark beer or white wine and braise this at 350 c ….. country style ribs are the best. Other ribs will work. Whichever, Sear ….. prime rib is nice but this is a treat for us born on the 40’s. You approach sounds amazing too. Making me hungry! Our grandmothers must have been sisters. I make it exactly as you do. HOWEVER, I always make sure there is a cup and a half to two cups of sauerkraut left ove along with a half of rib. Refrigerate it for one day then, In a large frying pan, warm the left over sauerkraut in two tablespoons of butter (just warm it.. .not recook it). Shred or dice left over pork rib and add it to the pan of sauerkraut. Cover pan. Nd contine to sauté. Prepare two cups of homemade dumplings. Cook a cup of diced potatoes. When both are done, drain well and add to the sauerkraut. Fold mixture. Warm a few minutes longer. Serve. Oh my word!! That sounds AMAZING!!! Love homemade dumplings already but with sauerkraut they would be out of this world. Thank you for the idea!! Made these ribs the other day, my only change was to add extra sauerkraut and a little sliced onion, and loved them. I also wanted to make Steve’srecipe so made sure to have leftover. WOW is that good! Thanks to both of you! Will be making again for sure! I am so happy to hear that Sue and love the idea of adding sliced onion! Thank you so much for taking the time to make it and for coming back to share this! Mom always made this recipe except quartered russet potatoes on bottom of pan. Dad’s favorite was potatoes on bottom, sauerkraut on top and ribs coated on top. With bbq sauce. I never cared for bbq sauce but loved the flavor of potatoes covered with sauerkraut. Could eat a whole plate of them. Thanks for reminding me of this dish. Will make this again on a regular basis. You are very welcome Maggie. It really is a dish that feels like home. Reminds me of my mom every time we make it. 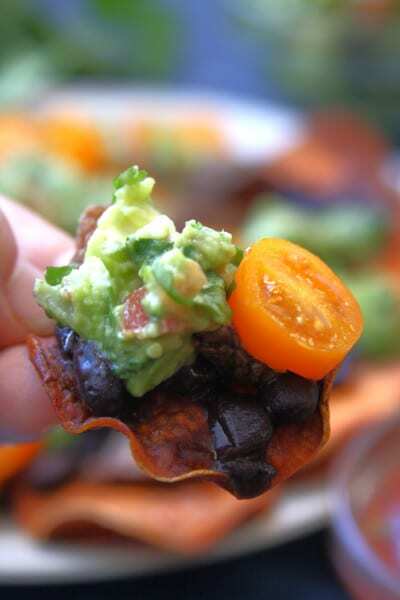 Very delicious recipe thank you for the delicious idea! I made this using baby back ribs but also added sliced onion and cooked it on stovetop in my stainless Dutch oven for about 2.75 hours then added thick slices of russet potatoes for a complete one pot meal and it was delicious! It reminded me of my girlhood friends mother, who was German American, and she often made this and left it on the stove for my friend (&me) to eat after school. I was trying to replicate her recipe for her savory ribs, kraut and potatoes and let me tell you, your recipe with my addition of onion & potatoes was like eating Gloria’s mothers cooking from her pot! I’m 65 years old now but the other day when I cooked this recipe I was 15 again! She didn’t add apples or brown sugar to her recipe either and I have searched for many years to get a similar recipe as hers. I don’t cook as much as I used to as I’m alone and living with bone cancer and esophageal cancer so I try to eat and cook as naturally as I can when I have the energy. I know my family would love this dish as well. The sourkraut turns into the most delicious and savory taste! 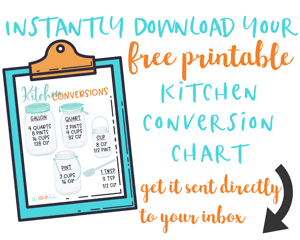 I would love to see more of your wonderful recipes and ideas! I didn’t cook an entire rack, just about half of the rack and I had leftovers that I will reheat and enjoy it for dinner tonight. Thank you for sharing your recipe and bless you & your family! Oh Charlene I can not tell you how happy reading your comment made me. It literally filled me so much joy and brought tears to my eyes. I will be praying for you the battle with cancer. Thank you again for not only making the recipe but also taking the time to share with me.